I have a good feeling about things. It's not very often that Don Draper is optimistic, but when he made that comment to his real estate agent just after defensively sharing that a lot of wonderful things happened there, he meant it. Strangely enough, this wasn't an anomaly. 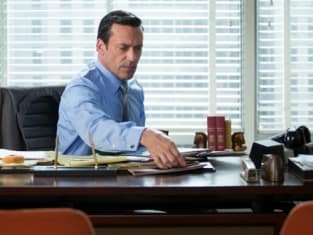 Don seemed to have a weight lifted off of his shoulders in Mad Men Season 7 Episode 10 and the task of writing the SC&P Address for Roger only added fuel to his emotional fire. Could he be getting his swagger back? As we count down to the end of Mad Men, it seems anything is possible. There was so much to enjoy in the hour and Don's attitude was the foundation. Joan was on business in California, strutting her partnership status and assisting in hiring a new employee. There were several nods to good old human resources, so here's a shout out to my old profession! Until now, Mad Man Season 7 has stayed fairly close to the unhappy Joan with a limited future. Despite having money, she had no luck in love. Did a chance encounter with a man searching for his optometrist in the wrong office change all of that? Richard seems to have money and charm and he almost walked away. Doing that gave them both something to think about. Sure, in the scheme of things it's a bit rushed to be thinking long term, but this is the 70s when The Love Boat and Fantasy Island will take flight. Love only needs three days to blossom fully; I know the rules. More than anything, we know Joan has a chance. She's not given up on love and Bob was wrong that choosing him was her only option. Never surrender! Peggy's issues with her performance review created brilliant material not just for Peggy and Don, but later for Don and Sally. When Ted wouldn't do her review, she asked Don to step in and needing the forecast, he went off the grid a bit. Don: What do you see for the future? Peggy: Well, um...is that on there? Don: No, I'm just curious. Peggy: I'd like to be the first woman creative director at this agency. [Don grins] That's funny to you? Don: No, I'm impressed that you know exactly. Permalink: No, I'm impressed that you know exactly. Don was genuinely surprised that Peggy still had so much passion for her work. He and his peers have lost their vigor for it and you could see the gears grinding in his mind as he considered using her thoughts for Roger's speech. When he laughed, again a raw and real emotion, Peggy mistook it for cynicism. Given past behavior it wasn't a surprise, but the look on his face when she stood up and walked out perfectly expressed how he felt. Was anyone else surprised at how different Glen Bishop looked when he showed up at Betty's door? He tried to hide the true purpose for his visit, but he was really there because he's never gotten over his crush on Betty. As soon as Betty said she was certain he would come back from Viet Nam, I really wished she had given him the kiss he wanted. He didn't seem like much of a fighter. Sally's trip with the girls at school led to a dinner with Don and all of her friends before they were off. I loved how it was tied back into the theme of what the future will hold. Sally: I'm so tired of people asking me what I want to do. Don: Well, if you're lucky enough to think of it, you should write it down, 'cause when you get older, you're gonna forget. Can you look back and recall the moment you made the decision to become what you are today? I can't. How I wish someone had told me what Don told Sally at that moment. Unfortunately, it's something else that will go unnoticed because her friend was flirting with him unabashedly with Don. When Sally told Don he and Betty were alike and any time anyone paid them attention they just "oozed," you could feel the sting of her words. That hurt. But he was also right not to embarrass her friend in front of the others. It's a tough call. Sally: You know what I'm going to write down for my dream? I'm going to get on a bus and get away from you and mom and hopefully become a different person than you two. Don: Hey! I'm your father and you may not want to listen to this, but you are like your mother and me. You're going to find that out. You're a very beautiful girl. It's up to you to be more than that. It's definitely not as easy as she wants to think it is, and I'm sure he wishes his girl will stand out and beyond her parents and not make the same mistakes they did. Isn't that what all parents wish? Throughout all of this was the the little poop Johnny Mathis, who totally blew the Peter Pan account and then screwed it up further by taking Don's advice literally, using his well-worn story as his own. The conversation that followed with Don was Don at his best. Don: You have a foul mouth. Take responsibility for your failure. That account was handed to you and you made nothing of it because you have no character. Mathis: You don't have any character. You're just handsome. Stop kidding yourself! Don: Everybody has problems. Some people can handle them and some people can't. Look at yourself because the next thing you're going to have to move past is losing this job. You're fired. There's not a bit of the down on his luck guy from Mad Men Season 6. Don managed to get himself together during the first half of this season and he's climbed right back to the top of his game. He's a decent man on his way to becoming a good one. He may have flaws, as we all do, but he's self aware and unwilling to be put upon any longer. He's fallen down, picked himself up and climbed back to the top again. But what's next? Don had a good feeling and on top of everything else, his apartment sold. He has 30 days to find a new place to live and reinvent himself once more. From ending in an empty apartment to ending outside his sold apartment with Roberta Flack playing, they're winning with the powerful close. There are only four episodes left and we have nothing but an incredibly cryptic trailer for next week to tide us over. What did you think of "The Forecast"? Do you have any thoughts on what's next? If you're here, I'd love to hear from you. 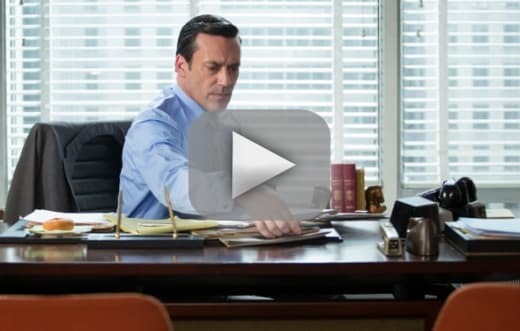 If you haven't seen it yet, you can watch Mad Men online right here via TV Fanatic. Richard: Have you ever been married? Richard: Boy, did he blow it. Betty: I'm going to miss you. You should really talk to them about Colonial Williamsburg. You're driving right by it. Sally: It's 12 states in 12 days. They can't stop everywhere. Betty: Well, when I did the trip it was six states. Sally: Weren't they still colonies? Permalink: Weren't they still colonies?